Superstar creative teams seem to be the trend at Marvel recently. Whether it's Joe Madureira and Jeph Loeb, Mark Millar and Bryan Hitch, David Lapham and Tony Harris or Brian K. Vaughan and Eduardo Risso, the name of the game seems to be mixing and matching big names on some of the publisher's top characters. 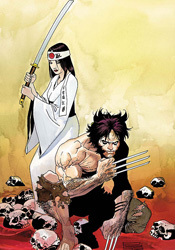 For Risso and Vaughan's Logan, the focus is more specifically on a long-forgotten chapter in Wolverine's history. We're suddenly remembering details about Logan's past right alongside the adamantium-clawed Avenger himself, and not all of the memories are good ones. Brian K. Vaughan, fresh off the conclusion of Y: The Last Man, is just the latest to explore the Canucklehead's undocumented history, and while his take on the character isn't the best, it's also not the worst. He tells this story with a strikingly small cast, but grants each character enough quirks and touches of individuality to fill in the gaps. Vaughan's storytelling is decent at best though, not his best work, and never really seems to hit its stride. The story's setting in WW2-era Japan is intriguing, although the big surprise near the end of the issue is a bit over the top, and leads me to wonder if there were ever a major historical event that occurred without Logan's immediate presence. Marvel needs to show a little more restraint, or else we'll be seeing a panel where Logan scratches a hole in the side of the Chernobyl cooling tower sooner than you think. During his run on 100 Bullets, Eduardo Risso has become one of the industry's best-kept secrets. His work with the seedy businessmen and stone-cold killers of the Vertigo series has been consistently atmospheric, gritty and inventive. His linework is thick but controlled, his characters undeniably human and justifiably flawed. Perhaps his greatest strength lies in telling stories with lighting alone – he can soak an environment in atmosphere through little more than the placement of its illumination. His characters wade effortlessly through the shadows as though they were a warm bath. In Logan, he successfully carries over each of his remarkable abilities, but something's still a little off. I think it's his take on Wolverine himself. The most visible member of the X-Men, Logan never truly looks like himself in this book. Risso seems to struggle with spandex, which is understandable since it's not something he's been asked to handle at all during his tenure on 100 Bullets. He's typically great at developing and depicting a real badass, (hell, Lono is basically an evil Wolverine in a Hawaiian shirt) but this rendition of Logan stinks. His work throughout this book, particularly in its backgrounds, is great… but his take on Logan is almost bad enough to spoil it all. Logan is a tricky book to critique. On one hand, its successes are tremendous – Risso's backgrounds are universally fantastic, and the new characters that Vaughan has introduced play off each other very well. On the other, its failures are equally spectacular – the artist's take on Logan himself, the brevity of the story and its ridiculous conclusion. I'm going to be gentle with this one and say it's worth borrowing. I was hoping for a little more than I got, but wasn't entirely disappointed, either.